Honnamana Kere is a fascinating spot among the many Coorg points of interest. 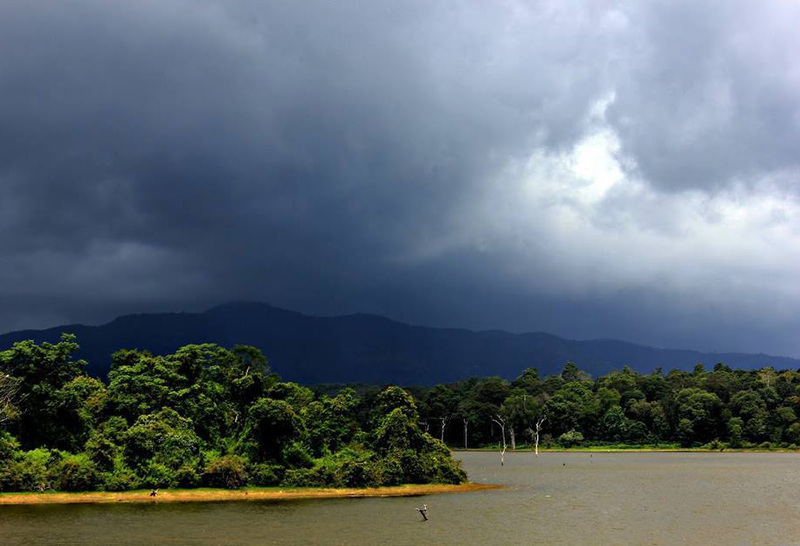 The biggest lake in Coorg located six kilometers from Somwarpet town, Honnamana Kere is revered as a holy place too. Surrounded by mountains, cliffs and coffee plantations, this is one of the most beautiful and serene Karnataka points of interest. The lake is surrounded by two hills – the Gavi Betta and Mori Betta. Caves that are believed to have been built by the Pandavas can be found amongst these hills. Honnammana Kere is also a popular boating and fishing spot. Another interesting aspect of this place is the annual Gowri festival that is held here. Newly-wed couples visit the lake during the festival. A special prayer ceremony is held here during the Gowri festival when offerings are made to the lake. While Honnamana Kere is an extremely serene place to visit, it also offers opportunities for adventure-seekers. Rock-climbing in the surrounding hills is a popular activity here. The views offered at the spot are simply breath-taking. There are trained instructors available to help you. Surprisingly, there is no fee for rock climbing at Honnamana. Boating here is especially enjoyable as the surrounding area looks absolutely magnificent. There are wild cats and elephants in the nearby forests. If you’re lucky, you might even be able to spot them. The plantations close to the lake provide a light, intoxicating scent of coffee that makes the boat ride even more pleasing. There is no fee for boating at Honnamana Kere either. The entire area is open from 6 am in the morning allowing you more than enough time to engage in activities like rock climbing, hiking, fishing, boating or just taking in the beautiful sights. The best way to reach this place is by hiring a jeep or a taxi. This place is a must-visit when you holiday in Coorg. Planning a holiday here and thinking of the best resort in Coorg to book? You could check out the Club Mahindra Coorg resorts in Madikeri and Virajpet. Offering comfortable and spacious rooms, the resorts come highly recommended on the Club Mahindra reviews. The restaurants will add to a memorable experience as you relish some of the delicious local food. The resorts also offer a variety of activities for you to indulge in with your family. Rest assured, a holiday here will be one you will remember for a long time. All you need to do now is get a Club Mahindra membership at the earliest to enjoy some of the best times on a holiday in Coorg. This entry was posted in Coorg and tagged biggest lake in coorg, honnamana kere lake coorg, honnamana kere lake karnataka, lake in coorg. Bookmark the permalink.